Right from the moment we wake up in the morning till the end of the day, we deal with hundreds and thousands of chemicals on a daily basis. Toothpaste, soaps & shower gels, deodorants, clothes, various kinds of packages, processed food, automobiles, buildings we live in – specialty chemicals are used in making each one of the them. Specialty chemicals are specific products providing a wide range of effects on which various industries rely on. They are recognized for what they do and the kind of solution they provide to meet customer application needs. For example, caramel manufactured from sugar is a commercially produced specialty chemical. Caramel coloring is extensively used in manufacturing of soft drinks and confectionery items. The size of the industry is pegged at $25.0 billion. 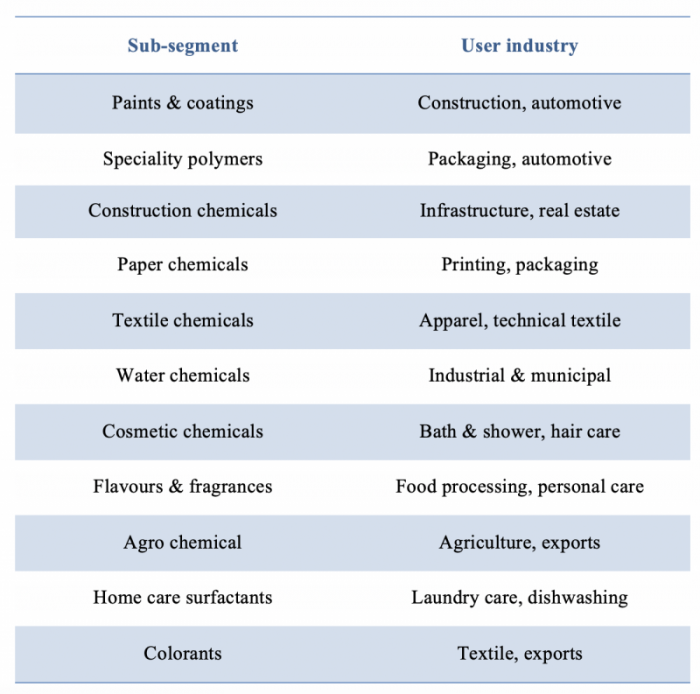 The industry has multiple sub-segments, the largest one is paints and coatings, which accounts for about 20% of the industry size. Specialty polymers are the next biggest segment and contribute 13% of the industry size. National Chemical Policy is expected to be released soon, the policy is expected to promote research & development in the industry as well as provide enabling environment and infrastructure for the industry.